As some of you may know, I have fondness for books featuring the great British boarding house – an interest sparked by novels such as Of Love and Hunger by Julian Maclaren-Ross, The Boarding-House by William Trevor, and perhaps the greatest of them all, The Slaves of Solitude by Patrick Hamilton. 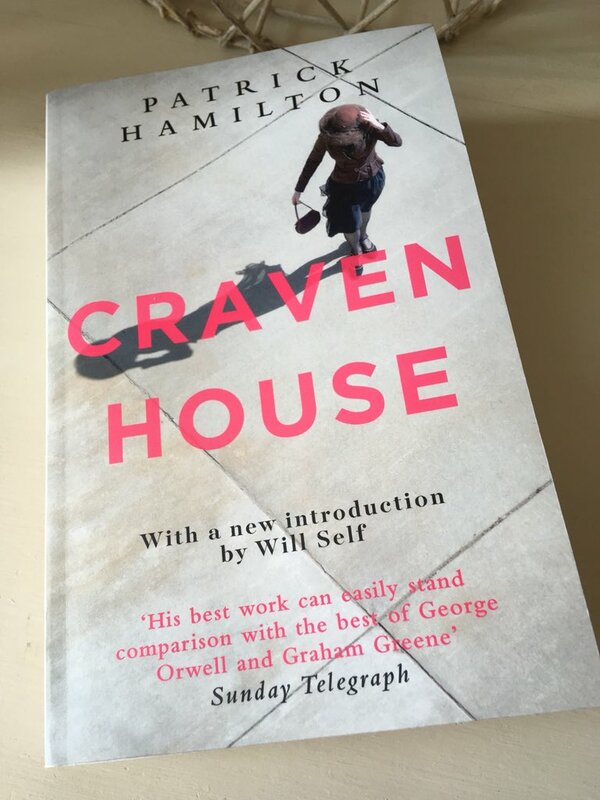 Craven House, a fledgling novel by the aforementioned Hamilton, fits right into this groove, set as it is in a West London boarding house during the early part of the 20th century. While Craven isn’t as polished as Hamilton’s later work – he was only twenty-two when the book was first published in 1926 – there is still much to enjoy here, particularly in the use of the setting as a vehicle for fiction. In some ways, Craven House could be thought of as a collection of character studies, an exploration of the lives and traits of the somewhat disparate group of individuals who inhabit this dwelling. While very little actually happens in the way of plot – the book reads like a sequence of episodes or occurrences – there is much to treasure in the characterisation, especially in relation to the younger residents of the house. Craven House is owned and managed by the tireless Miss Hatt, an outwardly amiable individual who has the general bearing of a ‘merry sparrow taking the sun’. Also crucial to the establishment – in terms of standing if not ownership – are Mr and Mrs Spicer, long-term friends of Miss Hatt’s from her school days. Mr Spicer is ‘In Tea’, although quite what that means in practice remains a bit of a mystery. Nevertheless, The Spicers like to think of themselves as a respectable middle-aged couple, a notion typified by the following passage on their fondness for walking, particularly on a Sunday morning. However, initial appearance may be deceptive, and Mr Spicer may not be quite as honourable as his wife thinks. In reality, Mr S has a penchant for attempting to pick up young ladies during his solitary outings to Hyde Park Corner, a practice that lands him in trouble a little later in the book. Paying guests at the house include twice-widowed Mrs Nixon and her young daughter, Elsie, and recent additions, Major Wildman and his young son, Henry – commonly known as Master Wildman. Finally, the cast is completed by two servants: the cook, Edith and the maid, Audrey, neither of whom quite live up to Miss Hatt’s somewhat unrealistic expectations of domestic staff. Nevertheless, Edith – a blotchy woman with the demeanour of a ‘Dickens character’ – proves herself to be an efficient cook, while Audrey seems pleasant enough, to begin with at least. The first section of the novel deals with the years immediately leading up to the Great War, a time when the traditional customs of Edwardian society were starting to crumble. Hamilton excels at capturing the sense of ennui in Craven House, the interminable mealtimes and stilted conversations in the drawing-room, especially as the guests attempt to get to know the new arrivals. In this scene, the residents are taking tea on a Sunday afternoon. It is the small details Hamilton focuses on here, the petty grievances and tensions that ensue when individuals with different habits come together under one roof. The Major, used to having hot water to hand at any time of day or night, takes it upon himself to have a bath early in the evening, a slot usually reserved for Mrs Nixon – a move that creates some commotion in the house. Perhaps the two residents who get on best are the playful Master Wildman and the obedient Elsie Nixon, a charming, amiable girl who finds a friend in her young companion. The pair play cards together during the evenings to pass away the time. One day, they even manage to escape the clutches of the tyrannical Mrs Nixon to visit the shops for an hour or two, an episode that lands Elsie in considerable trouble on her return. The relationship between these two children is very touchingly portrayed. The Great War is touched on very briefly, mostly to capture the darkness and uncertainty of the time. Only Mr Spicer is directly involved in the war effort, and even his particular contribution is less than spectacular following a rather short spell of action in France. Hamilton saves some of his best set-pieces for the novel’s final act, an extended section in which we return to Craven House six years after the end of the war. By this time, Master Wildman is in his early twenties, with Elsie Nixon following just a few years behind, worshipping her dear friend from close quarters. While Elsie longs to spread her wings a little in the hope that Master Wildman will fall for her, the dictatorial Mrs Nixon is having none of it, determined as she is to maintain a fierce hold over Elsie and everything she does. By this point, a new paying guest has also taken up residence at Craven House, the somewhat eccentric yet charming Mrs Hoare, an elderly lady who ‘employs flattery with a trowel’. One of Mrs Hoare’s most delightful habits involves her referring to various items by their initial letters, a practice that causes more than a little confusion and amusement amongst the residents. For instance, ‘Ell’ for Love, ‘Bee’ for Bed and ‘Doubleyou’ for Master Wildman. Elsie is very fond of Mrs Hoare – as is Master Wildman, although he cannot help but poke fun at her too, albeit in a rather gentle way. As the novel draws towards its conclusion, the simmering tensions apparent within the house culminate in a couple of dramatic outbursts. One involving the Spicers when Mrs S discovers precisely what her husband has been getting up to while her back has been turned; the other concerning Miss Hatt, who seems close to a breakdown after fifteen years in charge of the establishment. There is also a wonderful contretemps between Miss Hatt and Audrey (the maid) when the latter has the audacity to answer back to her employer following a rebuke over her tardiness. Naturally, Miss Hatt is stunned by the outrage, so much so that she decides ‘Audrey Must Go’. In spite of these dramas, there is a happy ending of sorts for two of the house’s inhabitants, a nice touch amid the darkness of the environment. Viewed in its entirety, Craven House is perhaps best suited to Hamilton enthusiasts. The novel itself is rather baggy, and some of the characters a little underdeveloped – Miss Hatt, Mrs Spicer and Mrs Nixon, in particular. At times, the prose is somewhat protracted and overwrought, a point that Hamilton himself was conscious of when he looked back at the work a little later in his career. Nevertheless, it is fascinating to see the early genesis of some of this author’s favourite themes here – particularly his preoccupation with the boarding house milieu and his interest in individuals who seem to carry an inner sense of loneliness and self-doubt. In some ways, Craven House could be viewed as a bit of a trial run for one of Hamilton’s later books, the utterly brilliant The Slaves of Solitude, one of the highlights of my reading year back in 2014. Craven House is published by Abacus; personal copy. This entry was posted in Book Reviews, Hamilton Patrick and tagged Abacus Books, Boarding Houses, Book Review, Classics Club, Fiction, Patrick Hamilton, UK on September 18, 2018 by JacquiWine. Early novel notwithstanding, this sounds wonderful, so much so, I just bought a copy. I love novels set in boarding houses, and havent read enough of them. Patrick Hamilton is certainly an author I should explore, I remember you writing about one of his books before. Great review Jacqui. Hooray! I think you’ll have a lot of fun with this one, Ali. While it’s not Hamilton’s best, there’s certainly quite a bit to enjoy – particularly in the interactions between the inhabitants of Craven House. Plus, I think you’ll love Master Wildman and young Elsie Nixon. They’re probably the most rounded characters in the book – rightly so, I think. I wonder if you’ve ever read London belongs to Me by Norman Collins. It’s a book I love and your review reminds me of it. Although I think Collins is rather more sentimental than Hamilton! No, I haven’t read it, but it’s been sitting on an old wishlist of mine for ages! Thank you so much for reminding me of it. I had a feeling it would be in a similar vein to some of Hamilton’s work, albeit a more sympathetic version. It’s great to hear that you rate it so highly. It’s a bit of a baggy monster but a book with a very big heart! Boardinghouses, and other places where strangers are randomly thrown together, can make for such great fiction. I also have come to enjoy novels that lack strong plots of the writing and character development make up for it. Too bad that the book had some other shortcomings. I have not read Hamilton, he sounds worth reading but I would probably start with a different book. Yes, that’s it exactly. The idea of random strangers being thrown together in a confined environment is always going to offer up the potential for friction and other sparky interactions. It’s what makes hotel novels so appealing too. Even though this novel had its flaws, I still enjoyed it a lot. Patrick Hamilton has become a favourite of mine in recent years, so it was fascinating to read this early example of his work. If you do want to give him a try at some point, then I would recommend The Slaves of Solitude. It’s probably his finest novel, and arguably one of the best books about Britain in the Second World War. Definitely worth a look. This sounds really good! Thank you for the recommendation. You’re very welcome! Thanks for dropping by. I have only read Hangover Square by this author which is very dark indeed. The hero struggles with drink and his murderous impulses are chilling. No light touches here, but regarded by somecritics as his strongest work. Lovely. The Norman Collins is looking increasingly attractive by the minute. I think you’d find Craven House an interesting read, especially given your fondness for Hamilton. It definitely feels like a bit of a rehearsal for The Slaves of Solitude, complete with those early hints of the greatness to come. Oh, how lovely – I don’t think I even knew this one existed! I haven’t read enough Hamilton (although I had loads lurking) but I think I will add it to the list to get to when I’ve read the major ones (and hopefully managed to remember which one it was I’ve actually read before…) Lovely review as always, Jacqui! Thanks, Karen. Oh yes, read the Hamiltons you have at home first. I only discovered this book myself when I saw it displayed on one of those ‘decades’ tables in Waterstones Piccadilly last year. I’ve picked up loads of fiction from those displays, particularly the ones covering the 1930s and ’40s. I love novels featuring disparate characters thrown together by fate. It’s a shame this didn’t fully work for you Jacqui but it sounds like the characterisation is spot on. It’s a great set-up for fiction, isn’t it? Plenty of scope for all manner of interesting interactions and disputes. Anyway, I still had a lot of fun with this one, flaws and all! Hmm… this review had me ready to press the “order” button, but then the loose bagginess gave me pause. Sounds like you are still definitely on the pro side, though, right? Reading this made me wonder: did we talk about Olivia Manning as a great writer of boarding house stories. Parts of both Trilogies (esp Danger Tree) and School of Love, above all, are boarindg house stories as well as stories of empire and war. Oh, yes – I’m definitely on the pro side with this one! I have a lot of affection for Hamilton’s later work, and given that this was a fledgling effort I’m prepared to cut him a bit of slack. You know, it’s funny – even though it wasn’t perfect, I actually enjoyed this more than some of the highly technically accomplished novels I’ve read this year, possibly as a result of Hamilton’s style and the boarding house setting. Yes, it’s somewhat baggy in places and some of the prose is too protracted, but it’s also rather charming and fun. Plus, I loved the characters of Master Wildman and Elsie Nixon – they’re really quite delightful. Anyway, you should definitely give Hamilton a whirl if you’ve never read him before – preferably with The Salves of Solitude as it’s set during WW2. And no, we haven’t talked about Olivia Manning in the context of boarding houses! Of course – I’d forgotten about Miss Bohun and her residence in School for Love until you mentioned it here. What a horror she turned out to be! Ok good to know. I will track this one down. I did read Slaves of Solitude, and I remember liking it, but it was a really long time ago. I’ve yet to read Hangover Square. And what’s the other one? Something like Ten thousand Streets or something? Twenty Thousand Streets Under the Sky. Not a Hamilton I’ve read yet, but it’s meant to be terrific. Hmm… maybe a readalong some time? I’m interested in reading Patrick Hamilton though it sounds like this isn’t the best starting place. Clearly boarding houses must have been ubiquitous, though unusual now – it’s certainly something that has to be explained when reading Roald Dahl’s The Landlady to teenagers! You know, a friend was saying some similar to this just the other day – that if you asked a bunch of twenty-year-olds if they knew what a boarding house was, then you’d probably be met with blank faces all round. It’s funny how these things change over the years as the social landscape shifts. Anyway, it’s a great setting for fiction, especially in the seedy areas of the city. If you’re looking to try Hamilton, then I would thoroughly recommend his later novels, The Slaves of Solitude and Hangover Square — it’s hard to go wrong with either of those. Lovely review, Jacqui. This sounds like a quite charming book, gently provocative. I can see why you’re drawn to boarding house novels. Have you read Hotel World by Ali Smith? I have it sitting on my shelf unread (as many books are) but think this adopts a similar framing. I count myself as a Hamilton enthusiast although I’ve still got plenty of his to read, and the idea of a collection of his character studies really appeals even if its not totally successful. Great review Jacqui! Thanks, Madame Bibi. I think you’d like this a lot. It’s a little more sympathetic and sentimental than the other Hamiltons I’ve read, but that’s probably a reflection of his age and outlook on life at the time. Read your others first though – I don’t want to be guilty of adding unnecessarily to your TBR! While I share your fondeness of the setting, I’m not sure this is for me. At least not before I’ve read Hangover Square or The Slaves of Solitude first. Oh, you should definitely read one (or both) of those first as they’re better novels – more polished and accomplished, particularly in terms of the narrative. He’s actually become one of my favourite writers, hence my interest in going back to this early effort. It’s not the most focused novel in his backlist, but it’s still very enjoyable!